You may have noticed that the blog border for the Easter season has been yellow. This will change to red when we celebrate Pentecost next Sunday, the coming of the Holy Spirit. The book of Acts, as we have mentioned before, is part II of Luke’s gospel. Both books are written to someone named Theophilus, though scholars are not exactly sure who this person was. Today we have the first 11 verses. In the first verse, Luke tells us that in his gospel (Part I), he dealt with all things Jesus did and taught until the day he was taken up (which is today). He is now sending his disciples out to the ends of the Earth to be his missionaries. There are two main parts to this reading: 1) Jesus tells the disciples about the coming of the Holy Spirit and 2) we behold the Ascension itself (the longer version). Jesus tells about the Holy Spirit: First, Jesus tells them the Holy Spirit will come. He says, wait for the promise of the Father about which you have heard me speak. For John baptized with water but in a few days you will be baptized with the Holy Spirit. The disciples are still caught up in logistics and asked him, “Lord are you at this time going to restore the kingdom to Israel?” But Jesus basically ignores the question. He says, “you will receive power when the Holy Spirit comes upon you and you will be my Witnesses a) in Jerusalem b) throughout Judea and Samaria and c) to the ends of the Earth.” The disciples will eventually come to understand Jesus’s plan, but right now they will have to trust Jesus is words. 2. The Ascension. At the end, we watch Jesus ascend to the Father. “He was lifted up, and a cloud took him from their sight.” Remember that a cloud was present always during the time Moses wandered in the desert with the Israelites. A cloud signifies God’s presence. Next we see two men dressed in white garments standing beside them. These are angels. They have an important line in this scene. “Men of Galilee why are you standing there looking at the sky? This Jesus who has been taken up from you into heaven will return in the same way as you have seen him going into heaven.” What they’re telling the apostles is, don’t just look toward the sky and daydream about the future and about what Jesus meant. He gave you a job to do. Take action and get going on your missionary ways. The psalm only increases in feelings of joy as we see more images of the Lord mounting his throne amid shouts of joy and trumpet blasts. For the first time in the Easter season, we are not in the 1st letter of St. John for the second reading. Today we are in St. Paul’s letter to the Ephesians. The main theme is the mystery of Christ, which was once concealed but now revealed. This is a fitting reading for the Ascension. Jesus, who was once concealed to his followers and so many others, is now revealed as the son of the Father in a most definite and visible way. Later we hear, “far above every principality, authority, power and dominion in this age and and the one to come.” Everything is beneath his feet. Jesus is head over all things to the church, which is his body, the fullness of the one who fills all things in every way. It states plainly in this reading that the Church is his body. Put simpler still, the Church is the fullness of Christ. This is a beautiful image indeed! Today we are called to act like Christ’s body and show others in our actions and words how Christ lived and loved. Today Mark answers the question, “what are the effects of Jesus’ Ascension? Jesus tells the disciples in the New Testament– on numerous occasions – that he will suffer die and be raised. Now it is time for him to return home. His earthly mission is complete. I suspect this would have been a rough day for the disciples, to see Jesus whom they have come to love and worship, leave them. But they took the torch. By the end of the reading, we hear that they “went forth and preached everywhere.” The power they were clothed with is the power of the Holy Spirit. It gave them strength to go out and accomplish their mission with great joy. 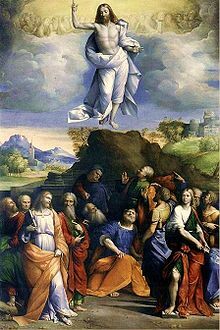 The Feast of the Ascension is a day for celebration. One of the promises God made to us is being fulfilled. God sent us his only son to save us from our sins. Jesus did that through his death on the cross. He opened Heaven’s gates. God will continue to keep his promise by next week sending us the Holy Spirit at Pentecost. This week, perhaps we can simply contemplate where we need God in our lives right now. How can we call on the Holy Spirit to walk with us? We are never alone. Jesus never planned to leave us alone on Earth. He gave us the third person of the trinity, the Holy Spirit. Stay tuned for next week’s readings at Pentecost and a Happy Mother’s Day to all!